Weekly Shōnen Jump celebrated its 50th birthday in 2019. The past decades, this influential magazine from Tokyo has introduced many manga stories that have since gone on to capture the hearts of audiences worldwide. 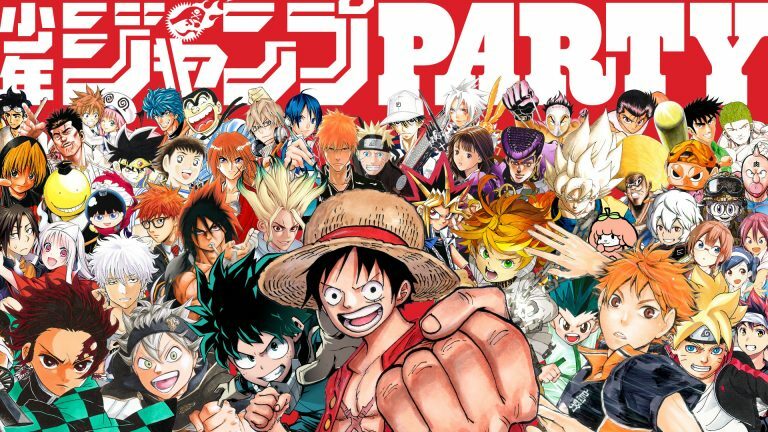 Just think of popular shonen (meaning boy or youth) series like Dragon Ball, Naruto and One Piece. These comics have been translated to other media including animations, live action films and games, creating multi-billion dollar media franchises. To put things in perspective, The Dragon Ball franchise alone has generated more revenue than The Simpsons, James Bond and Transformers. Manga is popular all over the world. In bande dessinee country France, 13 million mangas were sold in 2009, taking up 40% of the comic sales in that country. I would like to celebrate this feat by making my own top five list of my favourite manga from Shōnen Jump! These five titles are all great entry points for new readers who want to get into manga but don’t know where to start. All these series are available in English in print or digital. What do you get when you mix the world of Mad Max, and you insert Bruce Lee as the main protagonist? 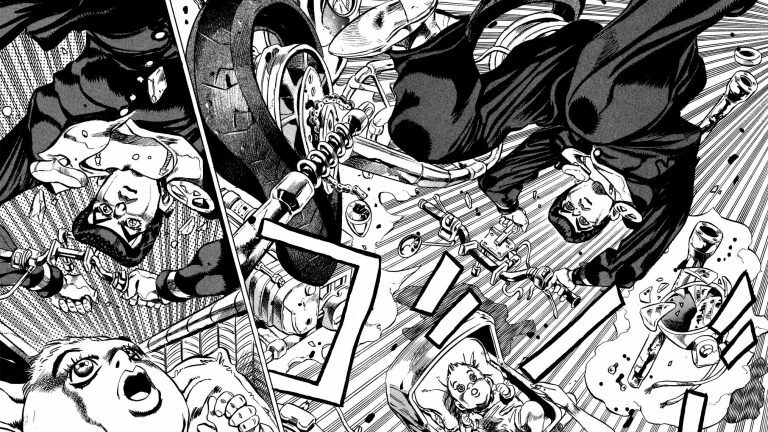 You get an unstoppable shonen hero, who basically can make people explode by touching a body part. Kenshiro stars in this manga written by Buronson and illustrated Tetsuo Hara. The reader follows him through the wastelands of a post-apocalyptic world set in the future – a world inhabited by thieves, bandits and murderers. Kenshiro makes it his duty to cleanse this world of these evil villains. His iconic catchphrase ‘’You’re already dead’’ is one of my favourite manga lines. 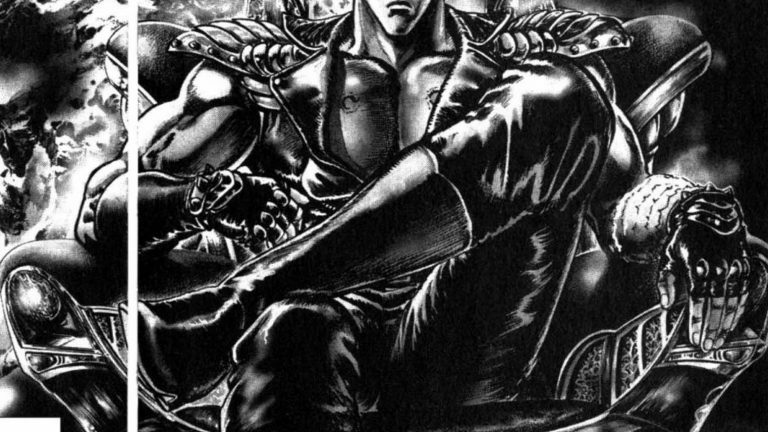 What makes Fist of the North Star one of my favorite manga’s is the fact that Hara draws his action in incredible detail. The panels flow seamlessly over to the next one, which makes the movements more fluid. The detailed depiction of gore is another reason of its popularity. The Fist of the North Star franchise has now made over 20 billion dollars (!). And it has inspired many mangaka (manga creators), including Hirohiko Araki (JoJo’s Bizarre Adventure) and Kentaro Miura (Berserk). Fist of the North Star volumes can be found on Amazon and eBay. Hanamichi Sakuragi joins the basketball team to impress the girls, but ends up liking the sport and becomes a formidable team player. 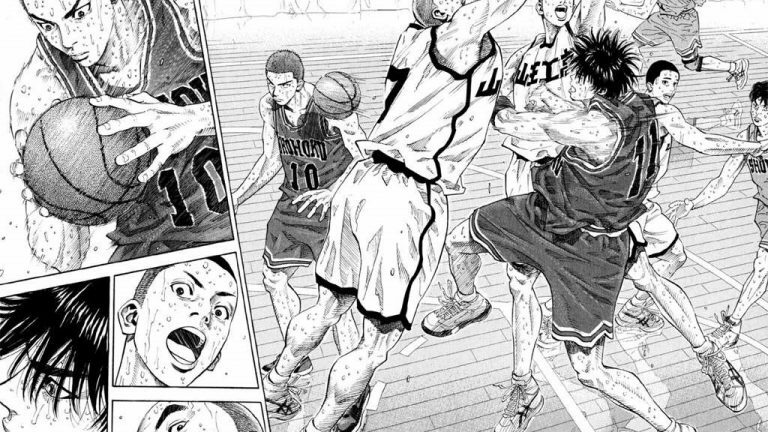 Mangaka Takehiko Inoue is a basketball freak himself and it shows in his work. In Japan, sport manga’s are a popular sub-genre. This has to do with the fact that most of these stories are told from the perspective of high school students, something their young readers can easily identify with. The basketball manga Slam Dunk is one I can personally identify with. Compared to other sports mangas, Inoue’s stories are grounded in reality, which makes it much more relatable. The emotions of the characters and how they are touched by basketball are described with great detail and passion. Not just that, the action flows from panel to panel in near perfect fashion and his drawings are super detailed. Slam Dunk is one of the reasons that basketball has grown in popularity in Japan. It has sold over 121 million copies, making it one of the bestselling manga’s. In 2010, Takehiko received special commendations from the Japan Basketball Association for helping popularize basketball in Japan. Slam Dunk volumes can be found on eBay, Amazon and Viz Media. Probably the manga that made the most noise overseas: Dragon Ball, created by Akira Toriyama back in 1984, is still popular today. If you’re of the generation that was born between 1985 and 1995 you probably have fond memories of watching the Dragon Ball animation series. I know I do. 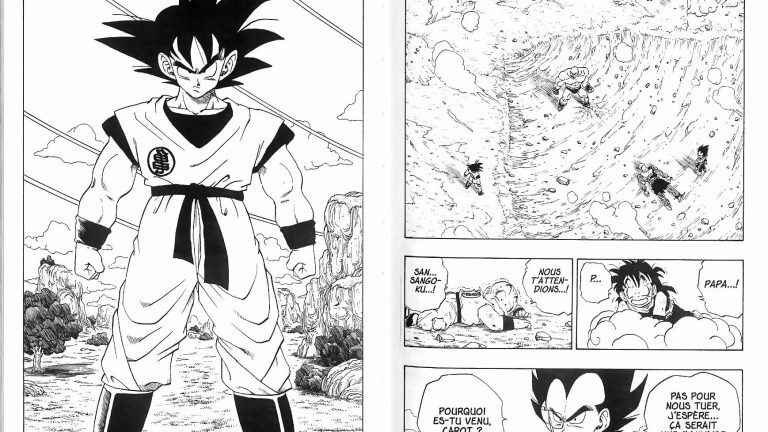 Main protagonist Son Goku is arguably one of the most popular characters in fiction. He’s a character that promotes kindness, humbleness and also a dedication to work hard to become stronger every day – a philosophy that can be traced back to Buddhism. The story centers around the mystic tale of seven magic dragon balls that, when they are collected, can grant the finder a wish. Over the years, Dragon Ball evolved into a more action oriented story, which was the main reason for its explosion in popularity. Even after its final chapter in 1995, the series is still not done. Just this year the Dragon Ball Super: Broly animated feature was released and met with critical acclaim. With a whopping 300 million copies sold worldwide, Dragon Ball is the second bestselling manga. Many writers have drawn inspiration from Toriyama’s story including great mangaka like Eiichiro Oda (One Piece), Masashi Kishimoto (Naruto) and Tite Kubo (Bleach). Monkey D. Luffy, the main protagonist, is a young man who wants to become king of the pirates. On his journey he meets new people who accompany him in his cause. Currently the bestselling manga by a large margin (150 million more copies then the second bestselling manga Dragon Ball! ), One Piece is also the longest running series released by Weekly Shonen Jump. With a story that spans over 92 volumes (that’s 900 chapters! 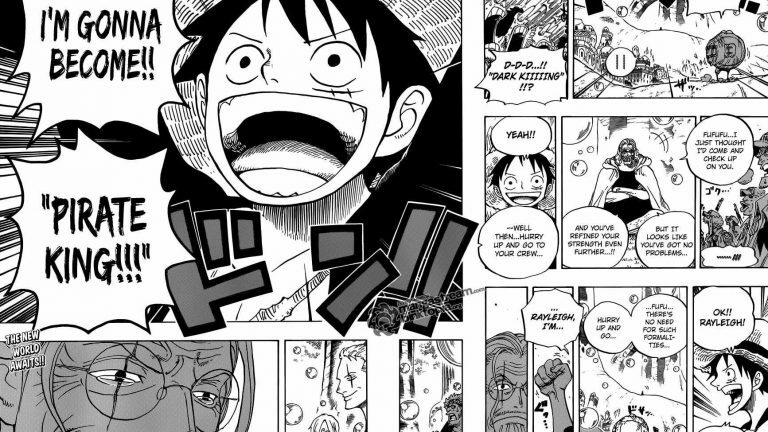 ), Eiichiro Oda’s magnum opus is a work of art. What makes the manga so special is not just the art style, but the variety of characters that Oda writes week after week. With a seemingly neverending story like One Piece, plot points can easily be forgotten, but Oda keeps the sprawling story coherent. There is a reason why One Piece is the bestselling manga and probably the most popular piece of fiction not just in Japan, but in the whole world. One Piece volumes can be found on eBay, Amazon and Viz Media. Even though One Piece might be the bestselling manga in Japan, for me, the best of Shonen Jump will always be JoJo’s Bizarre Adventure. What makes this manga so special is the originality and freshness it retains after the decades since it was first released. The great Hirohiko Araki accomplishes this by telling stories that span multiple generations. We follow the Joestar bloodline as they try to overcome the curses that have been put upon their family by DIO – probably one of the greatest villains ever conceived. The series consists of different parts and covers a lot of different genres. While the first part is a classic vampire story, the fifth part takes places in Italy, where we follow the Italian mafia that is led by a man with the ability to erase time. Then we go back to the deserts of Arizona, where the president of the United States is trying to collect the corpse of Jesus H. Christ (There is a reason why it is called ‘’Bizarre Adventure’’). The art changes with the stories – sometimes quite drastically, too. Also the cool pop music references are something to cherish: from David Bowie and Pink Floyd all the way up to the Foo Fighters and Lady Gaga. Araki uses these references just for fun, but sometimes the lyrics reflect important plot points. Right now it seems like there is no end in sight to the bizarre stories of Araki. His work has been shown in the Louvre in Paris and he also collaborated with Gucci. The stories of Araki have inspired many authors and have been referenced many times in other media. The so called ‘’Is that a JoJo reference?’’ meme will not be forgotten that easily. Wondering where you need to start? While I highly recommend starting from the first part, Phantom Blood, Araki designed JoJo in such a way that anyone can start with whichever part they want! JoJo’s Bizarre Adventure can be found on eBay, Amazon and Viz Media. Growing up in an immigrant neighborhood in Zaandam, Okan found admiration for film, manga, anime and games inside the confinements of his house. He developed an interest in specific types of storytelling, trying to analyse how two different forms of media objects can complement each other. For example, Okan wrote a piece about the game Bloodborne, where he analysed the structures within the game comparing them to literature and manga. Next to his internship he is currently studying to obtain his Master’s degree specialised in Film Studies at the University of Amsterdam.